For Mitch Wilde and the Roughnecks back-end, transition goals comes as a consequence of quality work in their own end. And those opportunities have been coming for Wilde. The 6-foot-3 defender had a number of quality chances against the Vancouver Warriors last weekend and eventually scored the game-winner. After a 25-point season last year that saw him score some incredible goals – as witnessed against Colorado on Feb. 10 – Wilde is in the midst of another quality campaign with seven points in eight games. Though he’d been held scoreless in the two games prior to last weekend’s victory against Vancouver, Wilde has kept working on his shot selection so he can keep netminders guessing when he’s galloping up the floor. “The one you’re talking about from last year, I think I just ran out of ideas,” joked Wilde. “I just couldn’t solve Dillon Ward. Remember this? @puckwilde41 scored this Goal of the Year candidate last time we played the @MammothLax! That ability didn’t come easy for the Brooklin, Ont., native, though. He had to work hard to develop his game to this point, and he’s not done improving just yet. While playing defence is priority number one, a well-timed transition goal can make all the difference in a contest. That’s true of last weekend’s 8-5 win, for example. “I think it’s huge,” Wilde said. “If you’re having a tough time scoring five-on-five offence, it’s an easy way to get quick goals on the board. A lot of times they can be crucial parts of the game, too. In that game last weekend, a quick transition goal led to two more goals and it really gave us the momentum. Wilde isn’t the only member of the Roughnecks defence that brings a strong transition repertoire to the turf. Zach Currier, Tyson Bell, Chad Cummings, Reece Callies, among others, are part of a young and athletic group that is able to consistently run the floor and force their opponents into track meets. “We have a lot of weapons in transition on our team,” agreed Wilde. “A lot of guys who can run and a lot of guys who can shoot the ball. 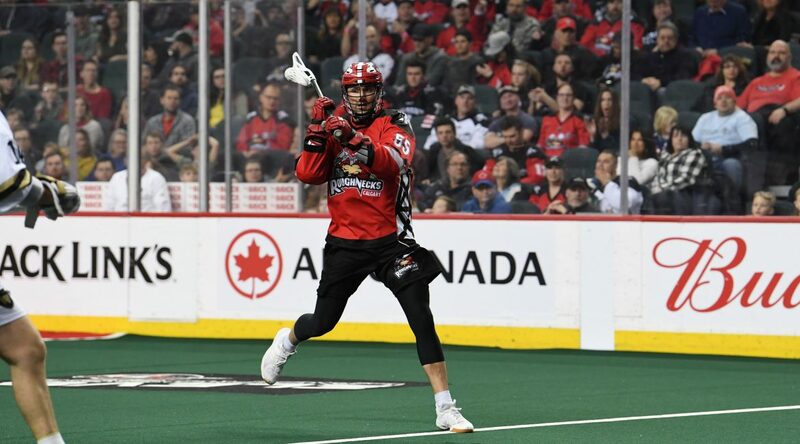 Wilde and company will take the show on the road to Saskatoon this weekend as they will face the Saskatchewan Rush for the first time this season. And he knows that his unit will need to play smart and use the right opportunities to win. “I think for us, transition against these guys will be huge because they’re such an athletic team as well,” explained Wilde. “They’re going to try to run us, so giving it back to them equally will be big.